Now, I am a child of the 80’s. Back then, you didn’t always get all the toys on your Santa wish list that you might get now. Things were expensive and money wasn’t quite the same as it is now. I asked Santa for Sea Monkey’s and well Santa didn’t quite have enough Sea Monkey’s to go round, so I didn’t get any. A bit like the Cabbage Patch Kid I asked for the following here. Santa wasn’t as good in the 80’s as he is nowadays. 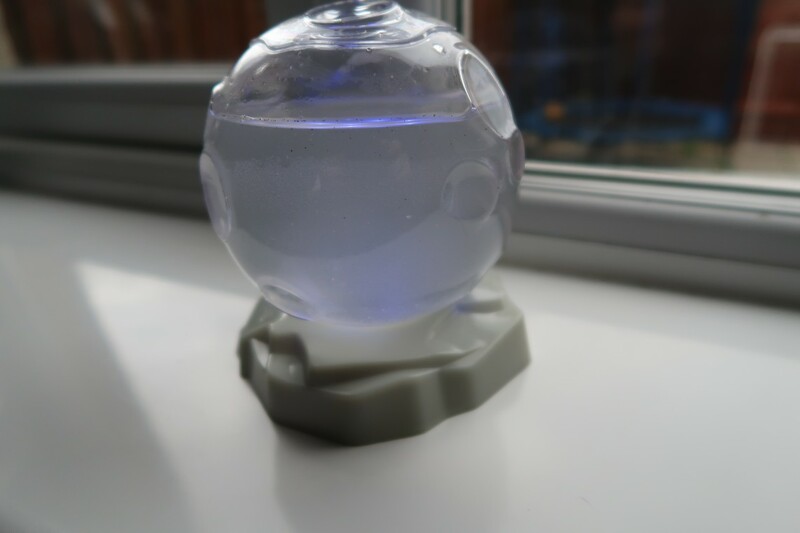 So, when the opportunity arose to review some Aqua Dragons, I had to give it a go. This is something I have waited, *cough* 30 something years to try out. And I have to say, these Aqua Dragons are pretty cool. Not only are they cool, but they’ve been in space. Way better than I could ever have hoped for. 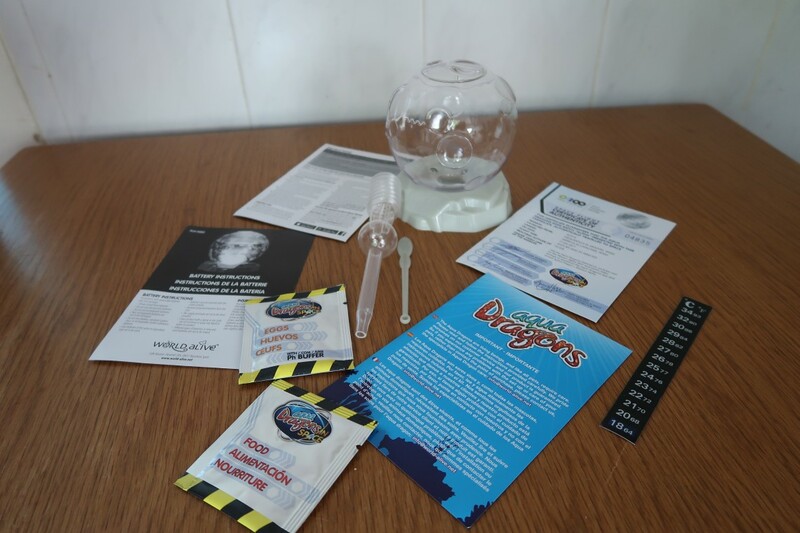 The items that are included are the tank, instructions, base unit, temperature gauge, Aqua Dragon Food, Aqua Dragon eggs, pipette, spoon/stirrer and a certificate. To get started, make sure you read the instructions. First, get the base unit out and add two AA batteries, which aren’t included. These aren’t essential, but they do make it look pretty. They work the blue light which works in the base unit. Add the correct amount of bottled water. We used a jug to make it easier to add and to get the right amount. It has to be bottled water. Make sure you have some to hand. 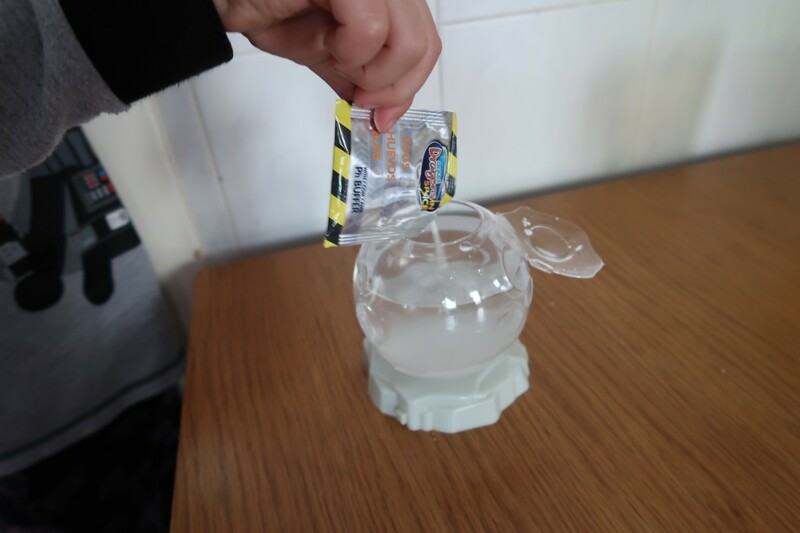 Next is to open the egg packet and add it to your water. These hatch upon contact with the water. It can take up to 48 hours before you see anything develop, but it doesn’t take long. Add in two little spoonfuls of food which is the bottom section of the stirrer. The lid lifts up to add the food. 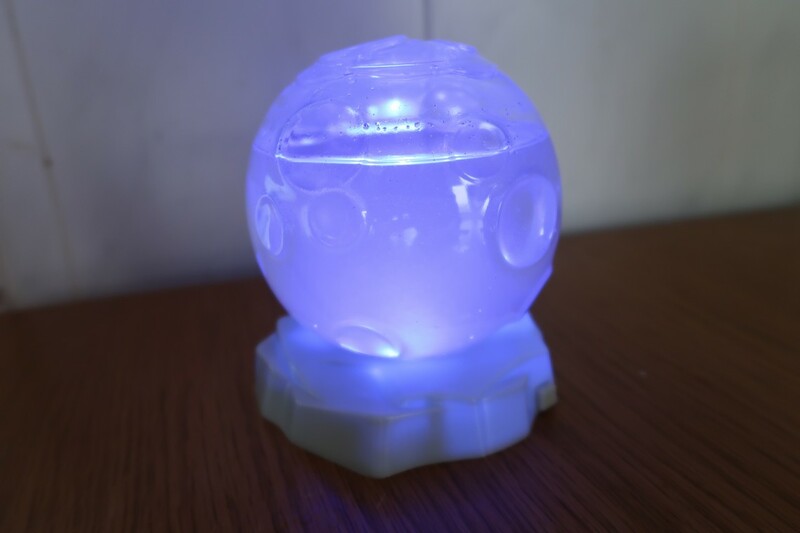 The stirrer glows in the dark as does the main tank also. It looks great, but haven’t been able to capture it on film. 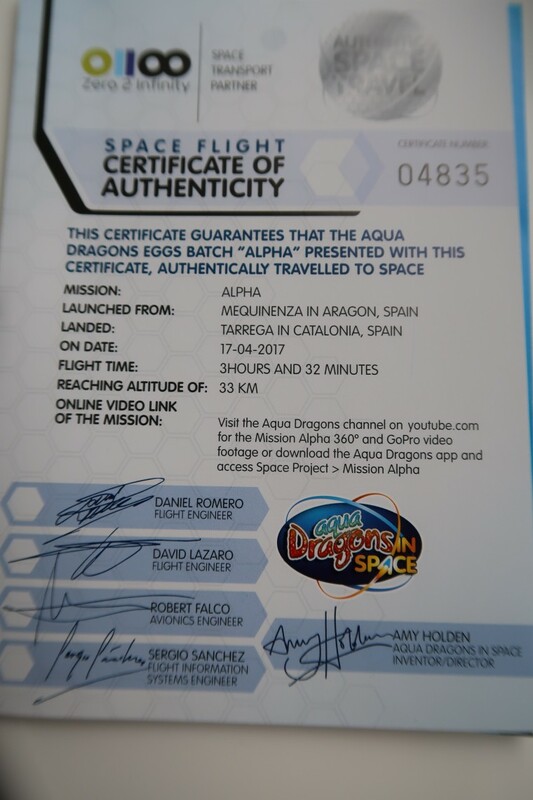 These are special Aqua Dragons as On April 17, their eggs were launched into Space from Mequinenza in Aragon, Spain. The total Space flight lasted 3 hours and 32 minutes. 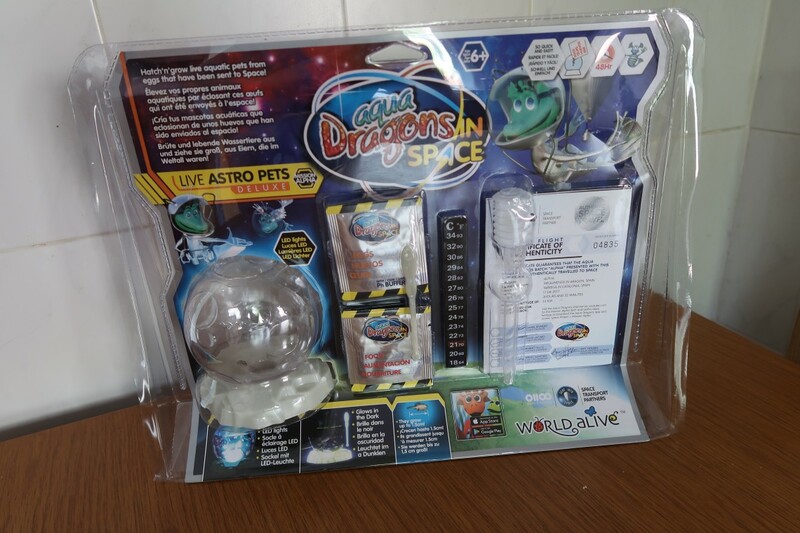 This launch started on the success of World Alive’s Kickstarter campaign to raise $50,000 for the launch, record video footage of the flight was recorded and then packaged in these space eggs into a new range of Aqua Dragons kits known as Aqua Dragons Live Astro Pets. How cool is that? It even comes with a certificate to confirm it. Wait 48 hours and you will start to see your little Aqua Dragon’s grow. They start very small but grow up to 2cm in length. Which doesn’t seem like a lot, but they look great. Aqua Dragons are a unique kind of crustacean called Artemia. This is a biological process called diapause that allows them to hibernate. They only hatch once in contact with water. They start off as tiny little black bits, then you can see their tails and then glide through the water. They are fascinating. 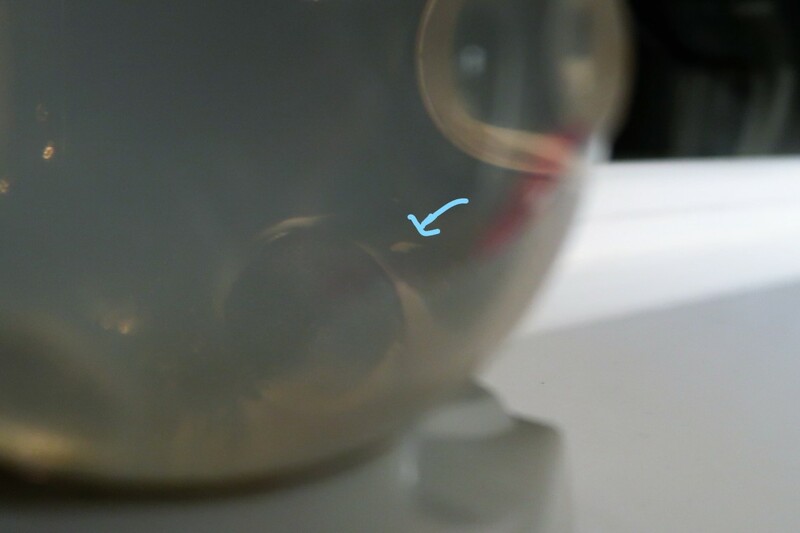 There is a magnified part at the top to see them when they are tiny. The Aqua Dragon’s should be fed 1 spoonful every second day. The food settles at the bottom of the tank as has a salt deposit. This is ok, as they need this to survive. The Aqua Dragon cycle takes around 45-60 days to complete. 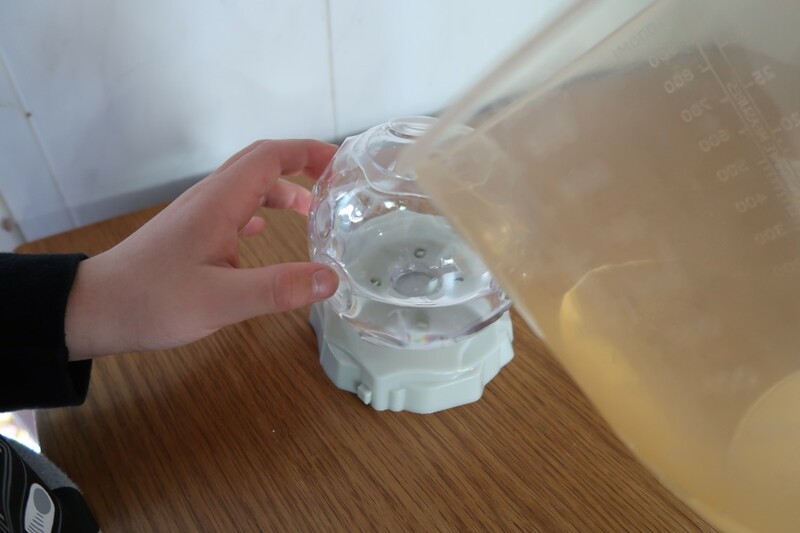 After that, you can leave your tank out in the sun to dry up and add water to start it all over again. How cool is that? Trying to photograph and Aqua Dragon is pretty tricky, they are quite small, but fascinating to watch. I put the arrow next to the one you can see. I loved nothing more than staring at their tank for hours watching them glide about. It is very relaxing and therapeutic. They look great. Are simple to look after and a very low maintenance pet. It is lovely to watch them grow from little specs into larger creatures. They are incredible. If your child is asking for a pet this Christmas, these are what you need. They need some looking after, but anyone can do it. Plus, they went into space, how cool is that? 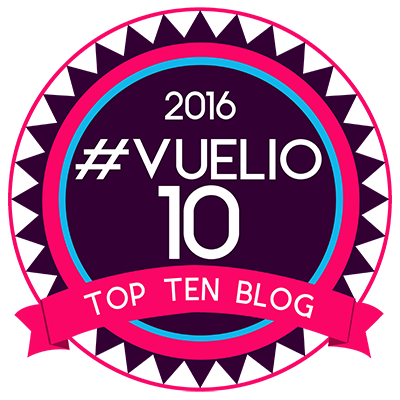 We loved this and would highly recommend them. It’s a great kit and kids love it. Especially us big kids who always wanted one. Check out the Aqua Dragons website where you can pre-order them. You can watch the full space mission the Aqua Dragons below. It is interesting. 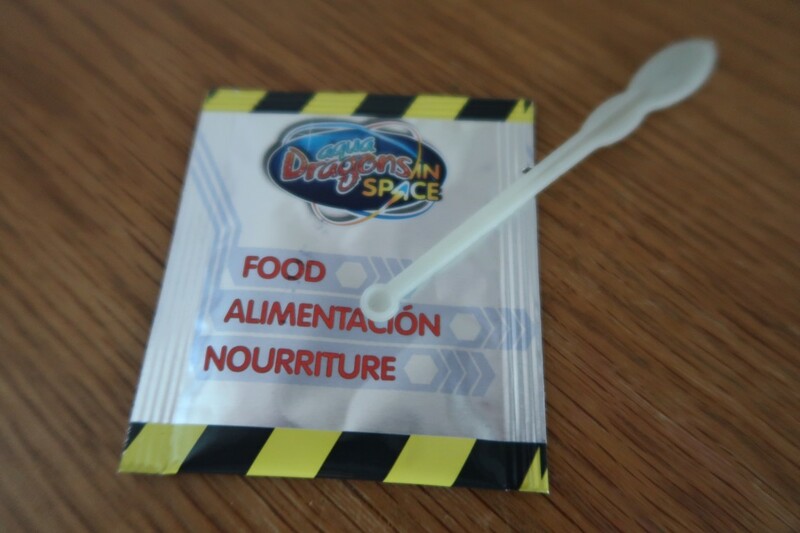 Disclaimer:- We were sent through and Aqua Dragons in Space kit, but all thoughts are my own and my 8yo self is delighted.